If you want the celtic animated ones replacing these Celtic, just overwrite this mod, it will retain all the other colored themes. (only if you can be civilized, please)? You da man, man! Thanks! Absolutely love the new colored icons. Thank you for sharing it with the community and of course endorsed! Can these be animated like your other ones? I actually like the look of vanilla menus and have a mod that loads vanilla in skyui however, I may try it again with your icons. Thanks they look cute. I understand one should only manually install one of the files provided, yes? It will overwrite the SkyUI one from its BSA, yes? I love the second set with the squiggly star, reminds me of the "you tried" meme lol. great work! Will you have enough free time in the near future to animate all the icons? Color and No Color? 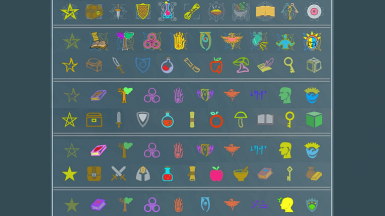 I support, I really want new and color icons of items =) please!